We’re about honest design here at Upswept, so today I’m opening with an honest admission: as much as I enjoy and rely on my Mac, and my iPad, and my iPhone, I never enjoy going to the Apple Store. A recent trip to the Apple Store also reminded me of critical things that go wrong with websites. That feeling I get walking through those Apple Store doors is what happens to droves of people who look at websites. Not only is it unpleasant, it also gets in the way of doing real business. Let’s start with what the Apple Store does well. The moment you walk into the store, it’s clear Apple made looks and atmosphere their top priority. The space has the clean lines we’re accustomed to seeing in their products, and employees wear uniforms that look comfortable and fashionable. The store is spacious, with high ceilings and open tables that give a communal feel. They took a bold approach by making the store feel more like a coffee shop or gathering place, and they hit that mark! Sadly, much like a number of websites I’ve seen, once the pretty first impression falls away, problems start bubbling up from underneath. A common issue with website homepages is having cool visuals, but not enough focus. As a business owner, it’s easy to convince yourself that every single thing you do needs to be on your homepage. The trouble is, adding too many elements onto your homepage can go from informative to intimidating really, really quickly. Walking into the Apple Store felt a lot like landing on an unfocused homepage: I walked in, and immediately felt overwhelmed by the options. I saw iPhones on my right, iPads on the left, desktop computers dead ahead, accessories across the way… the list goes on. There was too much to take in, so much so that I stood in the entryway, paralyzed and uncertain about where to go next. Ultimately, I stuck it out, because I needed help with an Apple product, and this was my only option. But, if this had been a website, this is the moment where I, and a lot of other viewers, would give up and leave. The other major place where the Apple Store and many websites fail, is laying a clear path for the people who visit. If you want a shopper to buy in on what you’re offering, it makes sense to guide them through, and make it easy for them to say Yes. At the Apple Store, once you take in what’s around you, it becomes apparent that there is no clear path. There’s no front desk, no sign telling you where to go, and all of the employees are usually busy chatting with other customers. All I could do was wait by the door, hoping that someone in a trendy Apple-branded track jacket would notice how bewildered I looked and come talk to me. I didn’t even feel like I could explore the products near me, because then the employees wouldn’t see that I needed help. On a website, you don’t want your visitors to feel that confusion–especially if they know what they’re looking for! Your website needs to connect them with what they want, and make the next steps clear. If they can’t figure out how to get what they want, they’ll end up going somewhere else to get it. 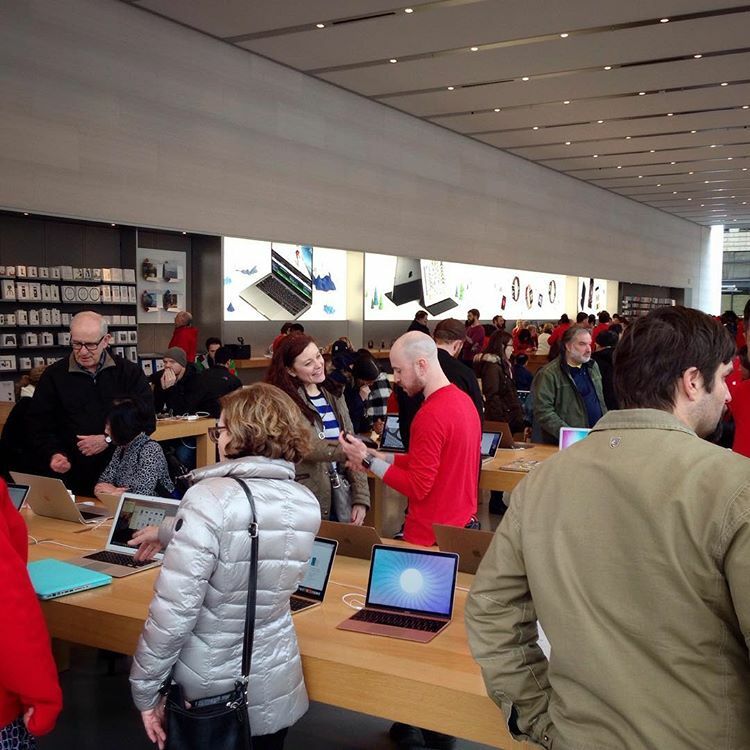 The Apple Store is a dreamy-looking place, but from a practical standpoint? I kind of hate it. I go there because I already know and enjoy using their products, but if I was trying them for the first time? I probably wouldn’t stick around. The lesson here? Beauty should never get in the way of doing business. That’s the key to good design: it creates an experience that’s appealing and enjoyable, and breaks down the barriers between your audience and what you can offer them. If your website isn’t helping you connect with your ideal people, then it isn’t doing its job.